Arts on Prescription are looking for people interested in Arts on Prescription at the Norris Museum in St Ives again - They start a new series on Wednesday 9th of January and I still have spaces. These are free art workshops for people with anxiety, depression or any other mental health problems. If you would like to take part in one or more workshops please fill out a referral form here. The #50000reasons campaign is encouraging people across Cambridgeshire and Peterborough to help the 50000 older people at risk from loneliness. 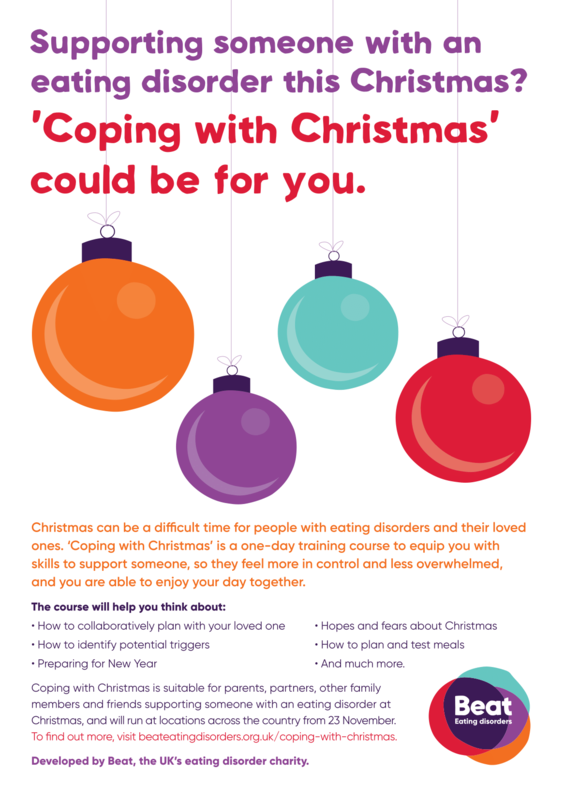 Christmas can be a difficult time when older people reflect on what they have lost from their life making feelings of loneliness worse. These 12 simple gestures could make a big difference to a lonely older person’s life this Christmas. Or a simple wave as your drive or walk by. It’s a great way to start. If you’ve never really spoken with your neighbours the festive season can provide the ideal opportunity to do so. Starting a conversation shouldn’t be scary. Everyone has a story and something interesting to say, so try and be open to having a chat. Make eye contact. Smile. Talk about the street,how long they’ve lived in their house, the neighbours, the weather.... or all four. For some people who are isolated, this might be the only conversation they’ve had in weeks. This Christmas why not make an extra effort and send a Christmas card to an older person living on your street? Be sure to write clearly and it would be extra-special if you make an offer to help or give assistance should then need it – write your phone number in the card. Even if the gesture is not taken up, it’s reassuring for somebody who may be experiencing loneliness to know that there is someone there if they are needed. When you drop the card off, you have an opportunity to start a conversation. Mention the offer that’s in the card. And try to build upon this. Should they decide not to attend, call by with a mince pie and tell them they were missed. Help older people who are housebound or living alone by offering to write and deliver their Christmas cards to loved ones and friends. Understandably, there can be many barriers to older people opening their doors to strangers. A good way to reassure them is to get another neighbour to introduce you. Alternatively, drop a note through their door introducing yourself and telling them you will be calling just to say “Hello” at a given date/time (always in daylight). Going along with your children or pets can also be reassuring. Take 10 minutes each week to phone a friend or family member you haven’t spoken to in a while. Better still, go and visit them or arrange to meet up for a pint, a coffee or a cup of tea. How many people are there in your life who’ve made a massive difference to you? It could be a teacher, a parent or an old friend, but it’s rare that we get a chance to say thank you. In the hustle and bustle of the modern world writing a letter might seem a bit old fashioned. But whoever is on the receiving end will appreciate the time and extra effort you’ve taken. To say “Hello” or at least wave when they see an older neighbour. For many of us, our friends tend to be a similar age to us. But that means we’re missing out on perspectives and stories that might change our life. Whether you’re eight or 86 we all have things in common, and we can all learn and gain from each other. Children often find it easier to start a conversation. This can help older folk to get out and about to do shopping, see friends and family or go to community activities. 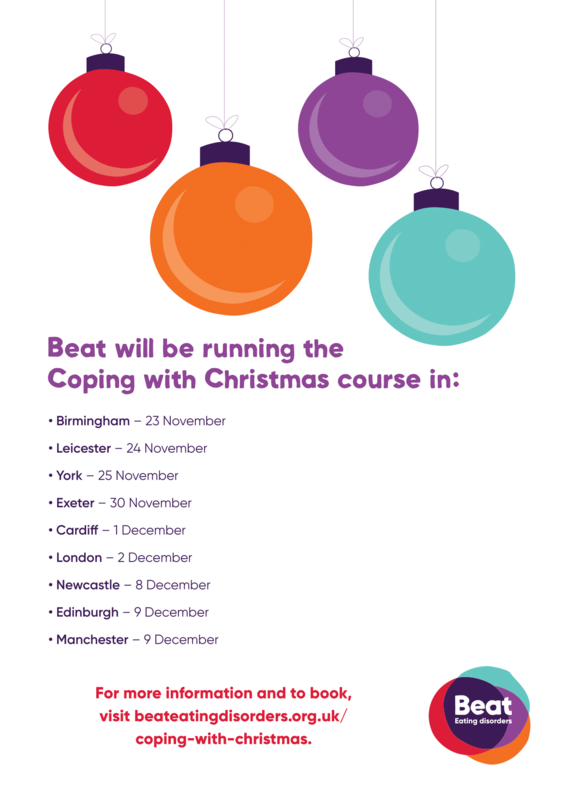 Beat, the UK's Eating Disorder Charity are running 'Coping with Christmas' one-day training. A friend suggested I run the Beachy Head 10K for my 50th birthday (I know you're thinking he looks far too youthful for the big 5-0). I guess she was gently pointing out I was going to seed as I've been out of the military for a couple of years! So instead of presents, I'm asking people to sponsor me for CALM - the men's mental health charity. Did you know suicide is the single biggest killer of men under 45? Mental health is a subject close to my heart. I've suffered from depression and also struggled after military detachments as well as academically broadening my understanding through post graduate study. That's why my work today uses the camera to promote spiritual, mental and emotional wellbeing. If I don't do this I'll just ask for a camera lens as a present and to be honest, I've got lots of camera lenses so the money is far better going to CALM where it can help lots of people and help change the tragic reality of male suicide. Keeping men alive by talking. You can support Steven here! A confidence building and soft skills development for economically inactive adults including ESA (Employment and Support Allowance) claimants through structured activity and support based at Huntingdonshire Community Plant and Tree Nursery, Godmanchester. The courses will include a range of gardening and food growing/preparation, craft-based and healthy eating activities to enable participants to improve their physical activity level, diet, social interaction, confidence, well-being and practical skills including potential retail volunteering opportunities. The programme will support future employability by providing opportunities for regular commitment and skills development; specific sessions to support employability will be incorporated as needed, plus onward referrals for career advice/guidance. Courses will run throughout the year using indoor facilities when necessary. We suggest anyone who is interested in joining the course gets in touch with the project lead Rachel Kelly first and arranges a short visit for a tour around the site and discussion about what we do and their needs. This helps to sooth initial anxieties about turning up to the first session and starting something new. It also gives us the opportunity to get to know them and ensure we can provide the right support and environment for them and the rest of the participants. These 6-week courses aim to improve health and fitness through outdoor conservation activities. It offers an alternative form of exercise for people who may be disaffected with conventional gyms and provides opportunities to learn new practical skills. Work includes conservation tasks such as coppicing and scrub clearance, and general green space improvements such as tree and bulb planting and path creation. The relaxed and social nature of the programme encourages participants to develop their confidence and communication skills. The programme is tailored to meet the capability of the group and any therapeutic goals that participants may have. Locations and dates of these courses are still currently being planned but will be shared once confirmed. If you feel like this project would work well in a particular area, please let Groundwork East know. This family gardening and cooking course current runs in Wisbech at various venues. It provides the opportunity for parents and children to learn and grow their own fruit and veg at home and try/share new recipes with the produce we grow. It’s a great opportunity for parents to get out and meet new people and to develop skills with their children. It also focuses on healthy eating, with any produce grown being available to take home and gentle activity through gardening. POLICE and Crime Commissioner, Jason Ablewhite is today (7th August) launching a new, independent and confidential Victim Services website for victims and witnesses of crime across Cambridgeshire and Peterborough. With Keep Your Head for Adults now having been up and running for a few months now we thought we would share with you some of the findings from the Mental Health pharmacy campaign that ran in May as we found out how many pharmacies were using both the adults and young people Keep Your Head sites! On the 14th June the World Cup begins. Whilst alcohol is not a reason or excuse for domestic abuse, there is evidence that domestic abuse incidents increase during large sporting events and alcohol is often involved in the incidents. Click here to see a study about it! Here are some posters you can download (check them out below), download them here and here! At the end of maternal mental health awareness week, Alexandra Vanotti details her experience of post-natal anxiety and the help she received - which she describes as a godsend. Locally, this will mean the establishment of a new, comprehensive service across Cambridgeshire and Peterborough, offering personalised and family-centred care. Work to introduce this new service in the area will start straight away. The health service is now spending £23 million nationally to roll out the second wave of community perinatal services to underserved parts of the country and is on course to achieve full geographical coverage, when as recently as 2014 it was estimated that only three per cent of the country had good access to perinatal mental health care. Dr Alain Gregoire, Chair of the Maternal Mental Health Alliance said: "In over 30 years working for the NHS I have never seen any national programme produce such a rapid, effective and widespread transformation in services. These new, top quality services have led directly to life saving improvements in care for women and babies that will hugely reduce immediate and long term suffering. The new developments announced today in England look set to eliminate a long-standing and serious postcode lottery, and will undoubtedly make England the world leader in mental health care for mothers and babies." The Perinatal Mental Health Care Pathways aims to improve access and quality in specialist perinatal mental health services as they become available. It sets out five new examples that promote improved patient treatment and care - depending on the mental health problem and the phase of pregnancy or the postnatal period – all of which put mums and children firmly at the centre of the plans. Shared expertise, good practice and local delivery can all be supported through the development and expansion of the 12 clinically-led regional perinatal mental health networks across England. About NHS England NHS England leads the National Health Service (NHS) in England – setting the priorities and direction, encouraging and informing the national debate to improve health and care. The NHS in England deals with over 1 million patients every 36 hours and employs more than 1.5 million people, putting it in the top five of the world’s largest workforces NHS England shares out more than £100 billion in funds and holds organisations to account for spending this money effectively for patients and efficiently for the tax payer. It strongly believes in health and high quality care for all, now and for future generations. For media enquiries please email england.memedia@nhs.net or call 0113 825 3437 between 9am and 5pm Monday to Friday. Out of office hours please call 07623 503 829. Hellblade: CPFT supported PC game about psychosis wins five BAFTAs !!! The game has just received the most nominations in the BAFTA 2018 Games Awards, across Artistic Achievement, Audio Achievement, Best Game, British Game, Game Beyond Entertainment, Game Innovation, Music, Narrative and Performer. The awards ceremony, hosted by Dara O’Briain, took place on Thursday 12 April at Troxy, London. Kate – who collaborated with colleagues from the University of East Anglia and Norfolk and Suffolk NHS Foundation Trust – hopes the paper will further the understanding of how the storytelling process can positively impact on those who use it. The findings suggest that storytelling can be a highly meaningful experience and an important part of the individual’s recovery journey. They also point to ways that UK mental health services could make more of the storytelling process. For a copy of the paper, please contact Kate. Some of the Recovery College East students have been involved in the publication of this fantastic new book, Road to Recovery: Our Stories of Hope. You can download a copy here! There are now printed versions available for you to buy that are just £5 each. If you'd like to buy a copy, you can send a cheque for £5 payable to Recovery College East to our Peterborough address, or you can pop into either of our colleges, in Cambridge or Peterborough, to buy one. (Addresses for the college sites are at the bottom of the article) We hope you enjoy it as much as we did!